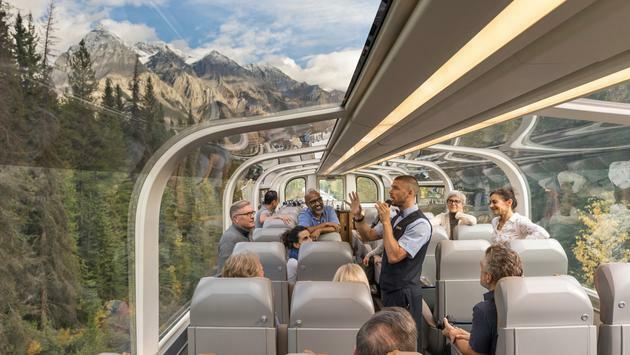 WHY IT RATES: Travel agents and advisors selling rail travel should consider Rocky Mountaineer and the train cars being added to its service.—Donald Wood, Breaking News Senior Writer. Rocky Mountaineer announced today that seven newly built GoldLeaf Service rail cars will be offered on its Western Canadian rail routes for the 2019 season. The world's largest privately-owned luxury train company will add four rail cars to its fleet in April, with three additional cars coming later in the season. The bi-level rail cars feature oversized glass-dome windows and a separate dining area for guests traveling through the Canadian Rockies. —Dimmable domed windows: The upper level windows use a suspended particle device layer, which can be dimmed to moderate the intensity of incoming sunlight. This is similar technology to what is used in luxury yachts and business jets. —Redesigned galley kitchens: The galleys feature upgraded ovens and stovetops, electrical grills, eco-friendly dishwashers, and optimal preparation spaces for meal preparation. —Custom-designed seats: The heated composite-leather seats recline without impacting the guest seated behind and can spin 180 degrees to create more social seating. —Enhanced ride quality: The cars feature other technical features that enhance the overall guest experience, including improved suspension design.